Farmer's Daughter Quilter: And the last shall be first!!!! And the last shall be first!!!! I keep forgetting that I should load the last picture I want to show first. 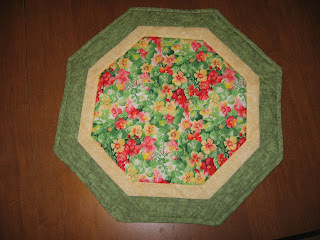 The bottom picture is of my first hexagon table topper completed. The second picture shows the trimming of the first border. 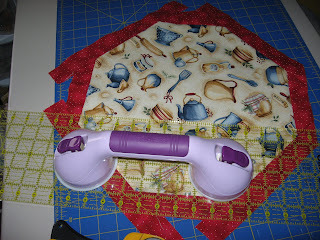 And finally the first picture shows the trimming of the first four pieces of the border. 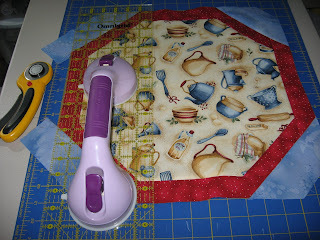 Campfire Girl June demonstrated this easy little table topper (which measures about 20" across) at our lunch get together on Wednesday. Good news last week. Bob went to the VA at Syracuse for a checkup on the carotid artery surgery last September. He is doing great and doesn't go back until October & November for next checkups on his three surgeries, quadruple bypass, AAA stent and carotid artery. It will be wonderful not to drive up Rt. 81 in bad weather. Bob left me a box of candy and a beautiful Valentine's Day card on the table this morning. He has a knack for picking out cards that bring tears to my eyes. Today I'm going to relax and knit more of my scarf while I watch several cooking programs. It's a cold, cold world!